Authentic, baked, vegan, gluten-free cheesecake! And it tastes like real, true cheesecake (no lie)! I’m so happy I could dance (and I totally did). I love all of these recipes, but they’re all raw and leave me partially unsatisfied when I’m craving a real, true baked cheesecake. I once ran a half marathon and then went straight to Cheesecake Factory and ate a giant slice of their white chocolate macadamia nut cheesecake. So TRUST ME. I think I know what “real cheesecake” tastes like (and this is it!). This recipe is not only delicious and insanely close to the ‘real thing,’ it’s also simple, requiring just a blender to make! Plus, there’s no water bath involved like a traditional cheesecake, simplifying the process even more. 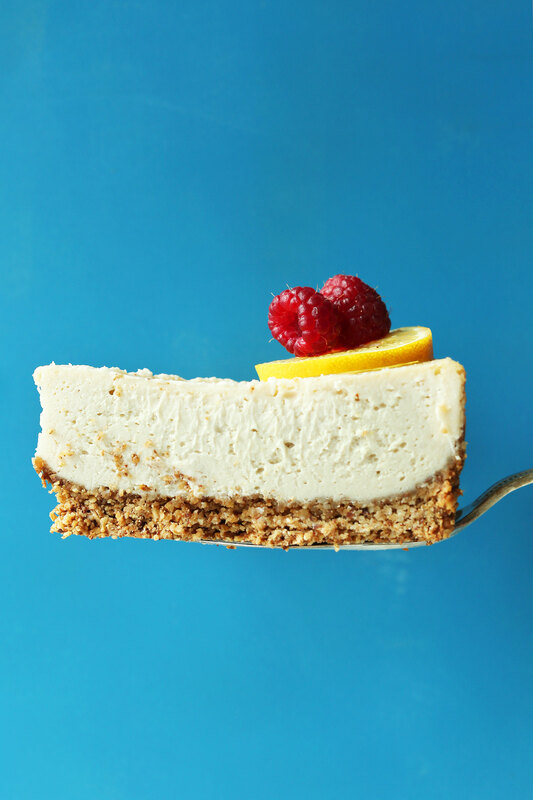 In other words, this truly is an easy cheesecake that just also happens to be vegan, gluten-free, and refined-sugar-free. Hello, thank you, I’m Dana, you’re welcome. The base is an adaption of my new go-to almond-oat crust that ends up tasting very reminiscent of graham cracker crust! And the filling is a mixture of cashews, coconut cream, and vegan cream cheese. I tested other varieties but found that this combination yields the absolute best texture and flavor. & Like the real thing! Make this cheesecake, because, well, you must! It would make a great one to have around for special events, like graduations, cookouts, bridal showers, baby showers…pretty much every occasion you can think of. The best part is it’s baked, so it can sit out at room temperature for hours without melting like frozen, raw cheesecakes. Another win! If you try this recipe, let us know what you think! Leave a comment, rate it – it’s super helpful for us and other readers – and don’t forget to tag a picture #minimalistbaker on Instagram! We’ve LOVE to see what you come up with. Cheers, friends! 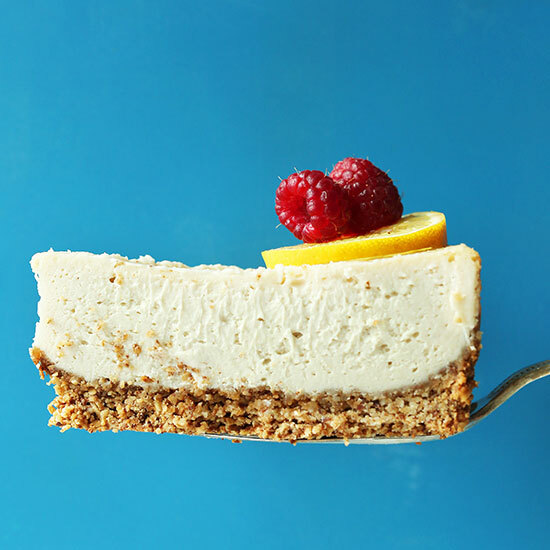 Amazing baked vegan cheesecake with a simple oat-almond crust that tastes like graham crackers! Easy to prepare, requiring just 1 blender! The closest thing to "real" cheesecake I've ever tasted. In the meantime, preheat oven to 350 degrees F (176 C) and line a standard loaf pan (or 8x8 inch baking dish // adjust number/size of pan if altering batch size) with parchment paper. Set aside. Remove lid and add melted coconut oil, starting with 4 Tbsp (60 g // amount as original recipe is written // adjust if altering batch size) and adding more if it's too dry. Pulse/mix on low until a loose dough is formed, scraping down sides as needed. You should be able to squeeze the mixture between two fingers and form a dough instead of it crumbling. If too dry, add a bit more melted coconut oil. *If you can't have cashews, the next best thing I can recommend is subbing either macadamia nuts,or upping the amount of coconut cream to 1 1/2 cups and supplementing with 3/4 cup extra firm silken tofu (amounts as original recipe is written // adjust if altering batch size). I have not tested the recipe this way, however, and cannot guarantee the results. *My favorite coconut cream is Trader Joe's brand. I highly recommend coconut cream over full-fat coconut milk. But if you can't find coconut cream, buy a couple of cans of full-fat coconut milk and scoop off the top cream. *I would not recommend trying to substitute the vegan cream cheese for anything else. It's essential to get that creamy, cheesy texture in this recipe. 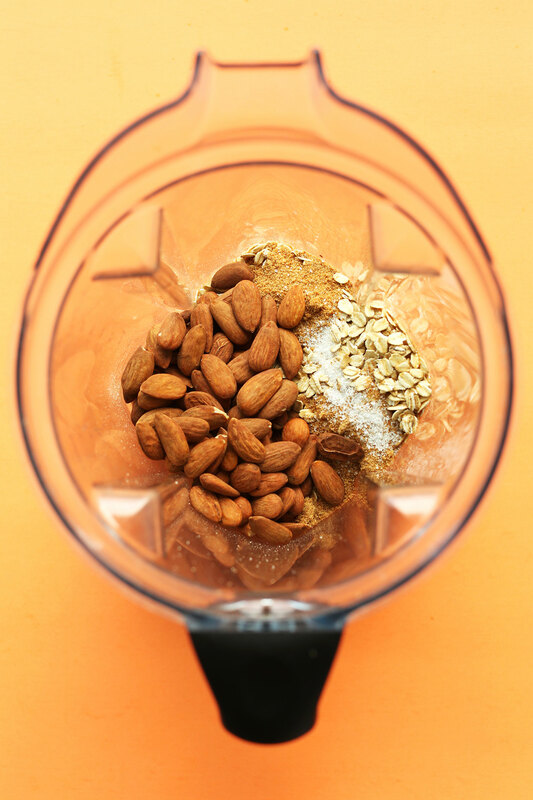 *For all other substitution questions (including oats and almonds), see our Recipe FAQ. *Recipe loosely adapted from my Creamy Vegan Lemon Bars. THIS will be my third time making the cheesecake. It’s amazing!!! The first try I ate the whole thing in a 24hr period! I’ve missed cheesecake so badly, this was perfect. Now for Easter I’m making a vegan Cadbury Creme cheezecake with this recipe! I love this recipe. 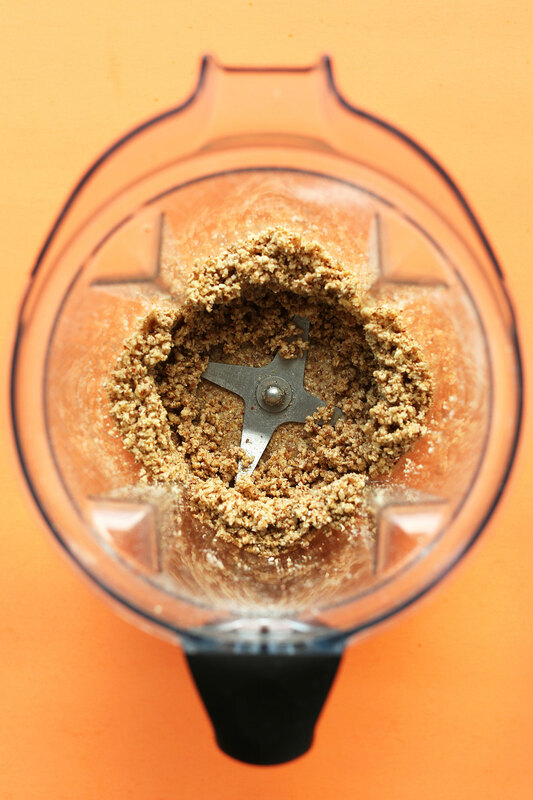 Would it also be ok to blend everything in a food processor? Hi Howard, we don’t think the texture would become creamy in a food processor. A high-speed blender would be best in this recipe. Hope that helps! Love this recipe! Quick question, can I substitute almond meal for almond flour? Or should I just use pecans/walnuts instead? I don’t have almonds on hand and I am making the crust. Hi Anastasia, we think pecans or walnuts would work better (though you may need to reduce the coconut oil if using pecans). But in a pinch almond meal or flour might work- you may need to play around with the amount of oil though. Hope that helps! Rather urgent question; son is making this for co-worker; my immersion blender died, would a blender or small food processor be best to make this-and most vegan recipes (I know that one-size doesn’t fit everything, but seeking the smartest solution) Thank you! We love your recipes, btw! We typically link in the recipe instructions whether a food processor, small blender, or high-speed blender would be best for the recipe. For this one, we recommend a high-speed blender. Hope that helps! I Love this recipe! I’ve made it three times, each time adding different flavors to the batter and different fruit toppings. I make mine in a springform pan but I get cracks on top. I cook it until it’s slightly jiggly in the middle but as it cools, it cracks, forcing me to cover it with a fruit topping. Has anyone else experienced this and know how to fix it? Hi Hope, one idea is that the pan could be too large. Hope that helps! I made it for our daughters’ bday – I baked it a tiny bit too long, I think because it seemed liquidy still. I also put it into a tart pan so it was undoubtedly not as thick as the loaf pan. Because of that, I dressed it up with your chocolate coconut mousse (w/out the peppermint) and added chocolate chips along with raspberries for a border. The whole family loved it! I have made this recipe numerous times. It has come out amazing everytime. It is so delicious and reminds me so much of traditional cheesecake. I always double this recipe since I have a giant family and a lot of people to share it with. It is super decadent and such a great treat. I do make adjustments when it comes to the crust depending on what I have. Instead of almonds I like to use walnuts since they are more affordable and work just as great. Sometimes I do also enjoy putting in some extras into the crust like coconut shreds, chia seeds, sunflower seeds, etc. The only other adjustment I’ll do is use less maple syrup then the recipe calls for. I’ll slowly add some in and then taste test it as I go to decide how much more I need. This is also a good base for different flavored cheesecakes. One time I even added espresso instead of lemon juice and lemon zest and it still came out awesome. Thank you for this amazing recipe. We have a friend who went thru a bone marrow transplant and now has Graft vs Host Disease. He has been struggling to maintain weight and needs a gluten and dairy free diet. I made this cheesecake for him and he loved it! He ate some every day and was able to gain some weight back- his doctor was ecstatic. I’m now making this cheesecake weekly for our friend. Thank you for a great recipe! This was delicious. Smooth and creamy, just like the dairy versions. I topped it with a light pastry cream, berries and mint leaves. 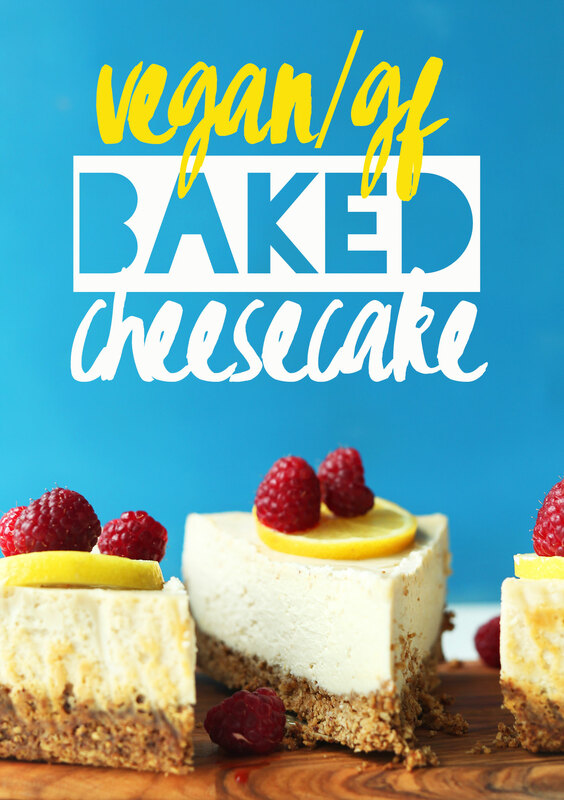 I have been looking for a baked vegan cheesecake because while the frozen cheesecakes are tasty, I wanted something closer to the original (and a cheesecake that I could eat when the craving strikes, without waiting for it to thaw). This recipe is it! Next time I will add a little more lemon juice and try a vegan Graham cracker crust. Thank you!! Yes, so sorry! I noticed that after it posted but I couldn’t go back and change it. I did bring the leftovers into work and my coworkers were shocked that this was vegan! Hi Rachel, our nutritional information is a rough estimate (see notes section on recipes for specifics about each recipe). When we calculate nutrition info, we use cups instead of grams in the software- so for maple syrup, 2/3 of a cup has 127.6 grams of sugar- we think that’s where the discrepancy is occurring. Hope that helps! Hi there! I really enjoyed making this recipe. I wanted to ask how could I adjust the recipe to make it a chocolate cheesecake.? Hi Howard, we haven’t tried that so we aren’t sure if it would work, but you could reference this Chocolate Cheesecake recipe for ideas. Perhaps adding dairy-free dark chocolate and reducing the maple syrup would work? If you give it a try, we would love to hear how it goes! I love this recipe! I have made it several times and enjoyed it even more so with time. My partner’s birthday is coming up and he loves PB and chocolate. Is there anyway I could modify this recipe to accommodate? Thanks and cheers! I’ve never left a comment on any food blog before, but Dana, your blog/recipes are the best ones out there and trust me I’ve looked and tried most of them over the 12 years I’ve been a vegan/vegetarian. This cheesecake recipe is so EASY and DELICIOUS. It tastes exactly like what I remember non-vegan cheesecake tasting like. Beautifully creamy and delicious. The crust really does taste like a graham cracker crust. You have done it again. I followed the recipe exactly. Used trader Joe’s vegan cream cheese and plain cornstarch. Had to bake it for 7 extra minutes. You were correct saying to bring up the crust the sides a bit which I forgot to do,. It was a little thick but that wasn’t a problem for me in the least. Believe me there will be a “next time” again and again for this recipe. It’s fast, easy, no crazy ingredients or instructions just pure enjoyment. Thank you for this recipe and all the recipes I’ve used from your blog and cook book. Please keep up the excellent work we all appreciate it. You’re a blessing. Hmm that is super strange. If you followed the recipe, that shouldn’t be happening.. I’m not sure what went wrong but am sorry that happened, DJ! I’m wondering if it had something to do with your coconut cream? Me too!! Not sure what went wrong??? I made this recipe as I recently had gotten Miyoko’s plain cream cheese and didn’t know what to make with it! I figured since Valentine’s day is right around the corner I would attempt this recipe… and it didn’t disappoint! For those that say the recipe separated, I would guess that you didn’t soak the cashews in hot water perhaps? I made sure my ingredients were at room temp, which might have prevented the separation that some people experienced. I did add a container with water to increase the moisture in the oven. My husband wanted to cut into the cheesecake last night, but luckily I was able to get him to hold off until this morning ( I intermittent fast so I personally haven’t tasted it yet!) He said it tasted light, flavorful, and super creamy! I will be serving it with thinned out raspberry jam and fresh raspberries! Thank you for a great recipe! I made this for a dinner party along with 2 non-vegan desserts and it was a hit! People loved it! I did substitute a different crust (7 ounces crushed speculoos cookies + 7 tablespoons melted vegan butter firmly pressed into bottom of pan, no pre-baking) and used a 9” springform pan. I baked for 50 minutes and that was a touch too long; would check at 45 next time for that pan size. It wasn’t a pretty dessert, perhaps because I baked it for a bit too long. I covered the top with thinly sliced strawberries and that looked/tasted perfect. Thanks for a yummy recipe! Can I freeze this cheesecake. It’s Thursday and I want to serve it Sunday. Thought I’d get ahead of the game. Do you have a substitute suggestion for the cashews in the batter? Attempting to make it with no nuts. Tried blended canned white beans but it didn’t give it enough body. Hi Alicia! If you can’t have cashews, I would recommend upping the amount of coconut cream to 1 1/2 cups and supplementing with 3/4 cup extra firm silken tofu. I have not tested the recipe this way, however, and cannot guarantee the results. Hope this helps! I work for allplants – an awesome b-corp helping to fuel the plant-based revolution! 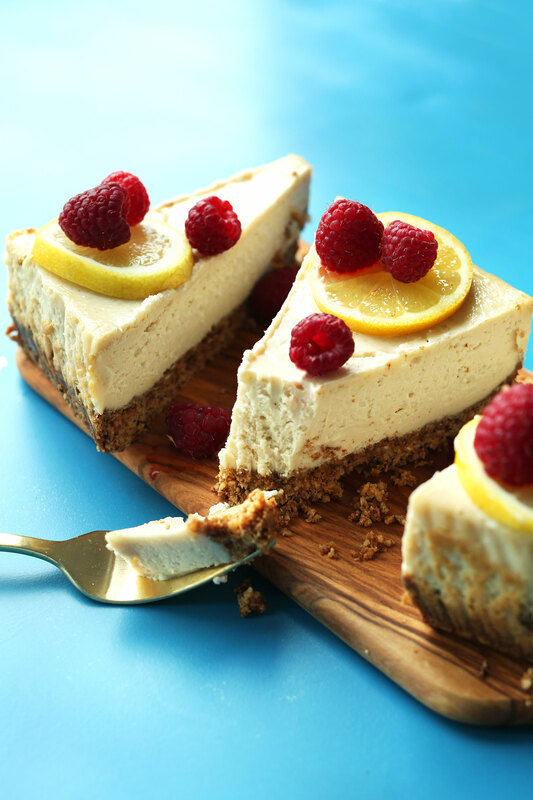 We love your recipes for your baked and Snickers cheesecakes so much that we have featured them both – along with the images – in an article about vegan cakes. We have shared it on our website and have, of course, credited you as the owner and linked back to your blog. Feel free to share our article too! Absolutely delicious! I’ve been thinking about trying to make make a vegan cheesecake for a while and this exceeded all expectations! I’m in UK and replaced vegan cream cheese with a vegan creme fraise which worked well. A mixture of golden, maple and agave syrup worked a treat and I drizzled blueberries on the top. My non vegan sons agreed it was top notch, thank you and look forward to making it again soon! I made this before Christmas and haven’t stopped thinking about it since… absolutely love all your recipes. Thank you !! I made this yesterday for my family’s Christmas dinner, and it was a huge success!!! I had a teensy mishap with too much coconut oil in the crust recipe, so I just doubled the crust recipe (I wanted a bigger size cheesecake anyway), and added carob. I must say this recipe is VERY forgiving! I used a full 13 oz can of coconut cream instead of just one cup, eyeballed the maple syrup, and omitted the lemon juice and zest since I was making a flavored cheesecake and baked it in a 9″ X 13″ dish. It turned out beautifully and everyone absolutely loved it! I wish I could attach a photo. Thank you for posting your recipe!! Hi, I just love this recipe! I have been makIng for every occasion for the last few years! I am a little skeptical about the tofutti nutritional value and did not like giving the tofutti to my young children. I have recently started making the cheesecake with coyo coconut yoghurt in replace of the tofutti and adding a little extra arrowroot. It is a lighter cheesecake like this but it still has that true cheesy tartness that this recipe guarantees, does not split and is still a crowd pleaser! I made this for a holiday meal but instead of an oat and almond crust, I used a bag of TJ’s gluten free vegan brownie crisps (and proceeded as per the recipe.) I used meyer lemon juice as well, and decorated with a bit of zest on top and some cacao nibs. Everyone, both carnivore and vegan alike, agreed this was the best cheesecake we had ever tasted. Made this in a springform pan and added a vegan chocolate ganache. So good…. can I ask what you used to make your vegan ganache? I’m so excited to find a baked vegan cheesecake!! I’m hoping to modify this to mini peppermint cheesecakes (muffin tin size). what recommendations would you have for that? what changes in baking time? I’d recommend baking them at 350 the whole time for just 15 minutes. I wonder if the maple syrup is essential to this cheesecake for flavor or can dates be used as a sweetener? I’ve seen some recipes that used dates and I want to try to make it with a natural sweetener such as dates. Do you have any suggestions about how I might go about doing that? Any feedback or suggestions are welcomed. Thanks! I can’t wait to try this recipe!! HUGE HIT with my non vegan friend who leases land to cattle ranchers. This recipe was absolutely AMAZING! The crust and cake itself held together so well. Baked perfectly. We used the Kite Hill brand of plain vegan cream cheese. We’ve been vegan for close to 3 years now and this is the first time we’ve had a baked vegan cheesecake. We made it for a Christmas family gathering (which had more non-vegan people than vegan) and every single person was raving about it! More than one person went as far as to say that it was the best cheesecake they’ve ever had! Thank you so much!!! Have you ever used goat cheese in place of cream cheese? Amazing cheesecake! My husband developed a severe allergy to eggs and milk protein (cow, sheep and goat- poor guy) about 5 years ago. He really misses milk and eggs, and substitutes are usually “meh”. For thanksgiving I made the family a cheesy, egg filled pumpkin roll, and I decided to make your vegan cheesecake for my husband. O M G… it is SO good! All the dairy and egg eaters were eating the cheesecake too!! After I made the filling, I tasted it like you suggested and decided to add a little more maple syrup, a little more lemon juice and a tiny pinch of salt. Thats the only thing I changed, and those changes were very minor and not necessary. Definitely make sure you own a good blender so you can get the filling nice and creamy smooth. It really is an amazing cheese cake. I’m going to make it again, and perhaps next time we’ll have left overs so I can try freezing some. I was wondering if including any fruit would change the recipe drastically. I really would love to try sweet potato cheesecake but I’m not sure how much to add and if the maple syrup needs adjusting. Thanks! I have been to pastry school, and I’ve never made a vegan dessert in my life. My aunt asked me to bring a vegan dessert to Thanksgiving this year, so I texted a friend who has lots of experience with vegan cooking and baking, and she recommended this recipe. I’m not going to lie, I was skeptical. Well, I guess you can say I’m a convert! I was shocked at how good this was, I can’t stop eating it, ha ha! While its not the exact creamy tang of cream cheese cultures, there is some definite chemistry afoot here in the way these ingredients combine to create a creamy tang all its own. I’m fascinated now, and have had a whole new world of baking opened up to me, thank you. Dana! Your cheesecake was perfect. Thank you for making this recipe. EVERYONE at my birthday party loved it and found it to be more satisfying to have then traditional cheesecake. Thank you for your hard work! :D No modifications needed, other than adding strawberry sauce on top of the cheesecake when serving. Wow! This is so good. I can’t believe it. I have missed cheesecake so much but nothing I tried came close. This crust is so much like graham cracker. The cheesecake is so smooth and delicious. My 7 yr old licked the blender clean after I poured the filling in the crust. Thank you!! I wonder if I can bake this recipe in a regular round cake pan? I am incredibly DELIGHTED with this recipe. This is the most authentic, vegan cheesecake recipe I’ve ever had. Waiting for the cheesecake to set overnight was a true test of willpower. I’m planning to cook down some strawberries and add them as a top layer to this cheesecake. -I found that the lemon was not as tart as I’d like, so I added a few splashes of lime juice to the mix. -I only added 2 tbsp of coconut oil to the crust, and supplemented the rest with water until the consistency was correct. -Instead of using 1 cup of coconut cream, I just used full-fat coconut milk from a can. I started by skimming off the top layer of cream, and then I kept scooping until I had a full cup. It didn’t change the recipe at all. I really don’t like the flavor of coconut. Any tips what I can use instead of the coconut cream? Can’t wait to try it otherwise!!!!! Though the recipe is not overly coconutty, you could try upping the amount of cashews and vegan cream cheese, but we haven’t tried and can’t guarantee the results! Would a food processor work or a regular blender if I don’t have a high speed blender? Thank you so much! Look forward to trying this recipe. It looks delicious. Do you think if I made it in a 10” spring form pan with glass bottom I would need to increase the recipe, maybe to 1 1/2? Yes I think that is a good call, Susan! Hey Susan! I made this last night in an all metal 10 inch spring form. I followed the recipe, and got definitely a thinner cheesecake. The taste and consistency are spot on though, and it made 20 small, really nicely portioned slices. I have pics on my Instagram @theveganchurchcookbook. Mine as well. I had white specks all over. Tasted good but looked horrible. I used Daiya cream cheese which is coconut based rather than tofu based. I am wondering if that is why. I also made the mistake of using roasted raw cashews. When I baked it came out very greasy. Thank you for te recipe. I made half of the recipe to try if it was good. A reviewer said she made the cream cheese with cashews. Because i also don’t have Tofutti i tried the same but we didn’t like the tast, it was to cashewy. I recommend to use (vanille) soy yoghurt or quark if you don’t have cream cheese like me. Now the taste is so much better! If you have a sensitivity to nuts – is there anything you can sub the cashews and almonds for? Hi Haley! See our Recipe FAQ for ideas (linked above). Hi! My friends are always asking me to make these non-vegan cheesecake bites that I used to make before I became vegan and I am looking forward to sharing a vegan version with them so that they can stop asking me for the other ones haha! Could you make this cheesecake recipe individually sized, using a muffin tray? Hi! Cannot wait to try this but just curious why a loaf pan and not a pie pan? Thanks!! You can use a pie pan! I was so impressed with this recipe! I didn’t want to do a raw vegan cheesecake you have to freeze and thaw so I was happy to find a baked version. I didn’t have coconut cream and unfortunately my can of coconut milk wasn’t separated so I ended up dumping the whole thing in and hoping for the best! It still came out great but a little flat. Excited to try with the cream next week. I made with a springform pan and topped with raspberries and lemon zest! I’ve been on a sugar-free diet for 7 months, and would love to make this cake for my birthday coming up next week. Have you’ve tried this recipe with xylitol or stevia? We haven’t, but if you experiment with it please report back! Hi, I am wanting to do the same! Did you try the xylitol? If so, did it work? This was sooooo good and sooooo easy! I used a glass loaf pan and I ended up baking it about 5 extra minutes. It was still jiggly but at the recommended time it was still very wet in the centre. For serving, I cut off the ends and put them back in the fridge for later and served the centre of the cake to my guests with fresh strawberries on top. So lemony and delicious everyone loved it. My husband and I ate the two pieces in the fridge the next day and they were even better, the flavours really melded together after sitting longer. I will definitely be making this again. Can I use regular rolled outs instead of gluten free?? Whenever I make this cake it turns very golden brown on the top and seems a little overbaked. I’ve tried decreasing my oven temp and baking it for less time. Any ideas? Hmm it sounds like your oven is running on the warmer side still.. While the edges should appear golden brown and there should be some browning on the surface, it definitely shouldn’t be overcooked. I would watch it closely next time, decreasing the time further, if need be! I made this for my son’s graduation party. I made individual size with the muffin tin and cut baking time down to 15 minutes. I made two more variations to the recipe. I made a blueberry version by adding 1 1/2 cups of frozen blueberries and a chocolate version by adding cacao powder. I substituted agave nectar for the maple syrup and made my own gf graham cracker crust. Every body loved them and my daughter in law took some to people that want to go vegan. I am making another batch right now before my son eats the gf oreo cookies that I got to make the crust with. Many thanks for this great recipe, it turned out really great even with replacing some of the ingredients. I substituted the coconut cream with coconut yogurt and the coconut sugar with brown and white sugar and a bit of coconut milk. Next time I will not bake the crust separately as it got a bit too baked. Hi Laura! We haven’t tried and can’t say for sure if that would be successful, but report back if you give it a try! This looks absolutely delicious, I CANNOT wait to make it! The only thing though is I live in India and sadly we don’t get maple syrup here. And neither do I have brown rice syrup etc, I only have honey but I’m afraid the taste of that might be too strong. I think honey would work, Parinita! You can always add less if you feel that it would be too strong. Let us know how it goes! This was an expensive failure, for me :-( I followed with no substitutions and it was a boiled mess. I can only think that the issue was the canned coconut cream, it must have had too much water content. I would suggest doing the option of buying the coconut milk and skimming the cream off the top. Can you think of any other reasons why it might have boiled? Hmm we are sorry to hear that, Meaghan! What brand did you use? I’ve made this recipe so many times over the past few years and love love love it! Everyone who tries it is always amazed when finding out it’s vegan. I try different toppings for a change each time, tonight it’s been covered in chocolate peanut butter caramel! I know that the cake freezes well as I’ve frozen it in the past, but was wondering if you know how long it would last in the fridge? Hi Viv! Store leftovers in the refrigerator, covered, up to 3-4 days, though best within the first 2 days. Your recipes have been such a blessing! I found that eating Vegan and Gluten Free made my Eczema disappear when doctors told me I’d be on steroid creams or shots for the rest of my life. Every recipe I’ve tried has always turned out amazing, so thank you! I would love to know how to make an instapot cheesecake :) this looks amazing!! Hi! So I have some people in my life that hate coconut : ( Do you have any suggestions for a coconut cream substitute in the recipe? Hi Chelsea! Though the recipe is not overly coconutty, you could try upping the amount of cashews and vegan cream cheese, but we haven’t tried and can’t guarantee the results! That might work, but haven’t tried and can’t say for sure! If you give it a try, report back! This was the best cheesecake I’ve ever made. And I’ve tried a few in search of the best DF/GF version! My kids–who were a bit leery due to prior attempts–were skeptical at first but then pleaded for seconds and thirds. Hubs loved it too. We served it with raspberry sauce (TJ’s raspberry jam, heated) and it was LOVELY. This will be a go-to for special occasions. A beautiful and tasty blank slate for all sorts of delicious toppings. I baked mine in a 8 in. round tart pan with removable bottom lined with parchment. I had to leave a message to tell you how delicious this recipe is! I got lazy and bought some vegan chocolate biscuits to use as the cheesecake base though. I made this for Easter and my whole family (all meat eaters) was impressed! Definitely going to make this again. Yes, that should be ok! Made it yesterday and it’s absolutely dreamy. I used Kite Hill cream cheese as I like it’s ingredients the best. This cheesecake didn’t have any of the weird aftertaste that sometimes baked vegan cheesecake can have. I truly believe that non vegans would notice a difference if they didn’t know it’s vegan. Wow made a spelling error – I believe non vegans WOULD NOT notice a difference from traditional cheesecake. Oooh. That would make it too savory, I believe. We ate this tonight made as listed in the recipe and it was perfect. The lemon juice and zest makes it tart enough and the creaminess from the coconut fat and cashews is perfection! I made this for my birthday and really liked it a lot. I’m not much of a sweet tooth but did want a little something. I’m not Vegan but am Paleo and have made fantastic strides in my appearance and overall health since changing my diet. This fit in perfectly and was a real treat, not just an “ok” substitute. I did make these changes, so if any of this is the problem, I will try again. –Pie pan instead of loaf pan. I’m going to try this this week. Just wondering why the recipe does not call for the use of a springform pan (?) and water bath ? I’ve always made ‘traditional’ cheesecakes and this will be a first for me. Feedback appreciated. It’s not necessary on this recipe. You can use a springform pan for easier serving. But neither are necessary! This was so yummy! How could I make this into a key lime cheesecake or pumpkin cheesecake? Thanks so much! Hi Amy! We’ve got a pumpkin cheesecake and you could probably use these key lime pies as a starting point for cheesecakes! Hope this helps! I made this cheescake but a passion fruit mango version instead and its delish. I simply added 2/3 cup of each and one more tbsp of arrowroot to make it more stable. You can probably just add about a half cup lemon juice and about a 1/4 tbsp of lime zest. If you can find key limes, which are small and round and extremely juicy i think it would be even better! Does the maple come through in the taste? I’d like to make this perhaps with corn syrup or thick simple syrup so I don’t have to use so much maple since it’s expensive, but I’m worried it will affect the taste if the maple is balancing with something else. Hi Alice! It is not overly maple-flavored but you could try subbing agave nectar, or honey if not vegan. Hope this helps! I made them with half maple syrup and half light corn syrup and it came out delicious! Hi- will this work in a springform pan just as well? Looks and sounds delicious but I want it to present like a standard cheesecake. Of course! Just bake in a small springform pan lined with parchment paper. Baking time will vary depending on size. Good luck! I made this lastnight (I definitely didn’t have it for breakfast…..) It’s absolutely delicious. I used light brown sugar in the base as I had no coconut sugar and slightly less maple syrup in the filling (that was just to suit my personal taste!) nicest baked cheesecake I’ve ever had. Love your recipes. This was amazingly good! I made this along with a traditional cheesecake for a birthday dinner, and it definitely holds its own. The crust recipe is so good I may switch to it for my regular cheesecake. Thanks for sharing! Hello!! This is my first recipe review because this recipe definitely deserves it. I’m a new vegan and the hardest part is letting go of cheesy goodness! I have to be honest… I was super skeptical that vegan cheesecake could turn out well, but my curiosity got the best of me and I had to try it. SO GLAD I DID! It’s astounding how well this mimics a good ole’ fashioned NY cheesecake… and it’s much healthier for you! My non-vegan bf said it was one of the best cheesecakes he’s had (although he’s biased). Thank you so much for sharing this recipe! YUMMY! I tried this recipe for a dinner I was catering. I needed a vegan dessert and cheesecake was on my list. I made a couple of changes-omitted the lemon zest and used 1 cup coconut sugar instead of maple syrup. The coconut sugar made the cheesecake caramelized so I added a apple topping. It was a bit hit, very creamy and vegan decadent. Thank you for sharing this recipe. I made this for a non vegan friend and she loved it! Well, so did I!! Can’t wait to make it again. The crust was great and the cheesecake was moist and great flavor. The first bite would have a bit of a coconut taste (slight) but after that it didn’t. I am not a huge coconut flavor fan, so this was my biggest worry. I actually kept tasting the batter to be sure it was right before pouring it in, and had a hard time stopping! I am planning to make it again and wanted to make it chocolate this time. Any ideas on how to accomplish that? I was thinking of using cacao powder and adding a bit more sweetness if needed. I am going to make a peanut butter sauce to put on top if I can get the chocolate part right. Unfortunately the vegan cream cheese the recipe calls for was not available, so I substituted Daiya cream cheese. It curdled when being mixed and the fat separated when being baked – maybe because it’s coconut based?. The flavour of the end result was good, but it looked like melted pizza cheese. I will try this recipe again if I can find the right cream cheese. Another reviewer said she tried it with homemade cream cheese and had excellent results. She said to Google recipes. I did NOT try this with this cheesecake, but it is a delicious cream cheese. I had my daughter do a blind taste-test it against the Trader Joe’s, and she said mine was better and more like the real thing. And SO EASY! Three ingredients. I made this for Christmas and it was absolutely the best vegan cheesecake I’ve ever had!! Everyone loved it! I made a strawberry syrup for topping, legit. Hi I just attempted to make this recipe and the mixture ended up rather watery. I follow the recipe to a T except for using a different brand of cream cheese. It doesn’t seem right wondering what to do? Has anyone tried subbing vegan yoghurt for the coconut cream? WOW! Another victory in the baking department. I was nervous to make this recipe because I have never made a cheesecake before. After much patience and meticulously following each instruction I woke up to a beautifully chilled and set vegan cheesecake that is blowing the minds of my non vegan family! The flavors really come together post fridge time, thoroughly impressed and will be making this again soon!! Thank you! Thank you soooo much! I have been craving cheesecake but my gluten and sugar issues have blocked me. I made this for a Christmas party. I wanted to make it more festive so I put it in a pie plate (2 actually as I doubled it). The crust got a teeny bit overcooked – might have needed more coconut oil – but it was a big hit! I wanted it to be a little sweeter and more fun so I put homemade cranberry sauce on one of them and Trader Joe’s Raspberry fruit spread on the other. Delicious! Can’t wait to try other recipes :-) ! I made this for my daughter’s b-day. She is allergic to nuts, so went with your suggestion: upping the amount of coconut cream to 1 1/2 cups and supplementing with 3/4 cup extra firm silken tofu. Can I make this as mini cheesecakes? Hi Anna! That should work! Will these turn out ok as mini cheesecakes? Hi Anna! Yes just lower the baking time! Is there any way of making this recipe nut free? I would like to make one for my boyfriend but he’s allergic to nuts. He’s also lactose intolerant too which is why I’m seeking this vegan recipe. Hi! You could try sunflower seeds! I’ve tried several of your recipes so far and they’ve all been a great success! Every year I make a bailey’s cheesecake for Christmas dinner and I was wondering if you think I could make it work with this recipe? This will be our first vegan Christmas and I want to make my husband his favourite dessert haha. Bailey’s does have an almond milk Irish cream now, or I’ve also found some recipes online. If you think it would work, are they any ingredients that I would need to alter to account for the extra liquid? I usually only need 1/2-3/4 cup of Irish cream. Hi Diane! Yes you can! I made this tonight and it’s absolutely wonderful. I’m so excited that I can have cheesecake again but with out all the dairy and sugar. I’m in heaven. I had extra cheesecake mixture so I made 8 little ones in a silicone muffin pan as well as in a glass pie pan with parchment paper. I just made more crust mixture. I used the whole can of coconut cream and a 12oz bag of cashews instead of a cup of each and it worked great, I just added a heaping tablespoon of the arrowroot. Trader Joe’s brand vegan cream cheese is the same as Veggie Go. Can i opt out the lemon? Lemon helps with curdling and the tang that cheesecake has! A friend made this and brought it to my house. It is unbelievably delicious! It takes exactly like cheesecake, and with a similar texture. It’s got a lot of fat and is an indulgence, not a health food, but it’s vegan and gluten free! I highly recommend it as a treat for special occasions. Can almond cream cheese be used as a substitute for the vegan cream (ie. Tofutti ) cheese? Do you think I can sub the vegan cream cheese for normal cream cheese in 1:1 ratio? I’ve made this cheesecake 3 times now, and it has come out perfect every single time! It is virtually idiot proof! If someone with baking skills as terrible as mine can make this, anyone can! It is the best cheesecake I have ever had in my life – vegan or non vegan. I highly recommend this recipe to all! Really amazing. I looked up cheesecake recipes a long time ago, came across your raw recipe, and didn’t like it. I thought I would never have a good cheesecake again. But I had no idea you had a baked one. This recipe is really fantastic. I used tofutti cream cheese and made a graham cracker crust. This tastes just like a cheesecake! (Minus the heavy feeling afterwards and coat of cream in your mouth). My mom said it was “perfect” and the sister asked if she could devour another slice. You could easily serve this without anyone knowing it’s vegan. A very solid cheesecake recipe. Hi ! i would like to make this recipe but i have allergy in every nut .. Can i replace it with coconut cream ? See our Recipe FAQ for ideas (linked above). Can I use a 9×9 standard pie pan instead?! Hi Nat! That should work! How did it go in the pie pan? I am about to try it with a spring form pan, kinda nervous! Hello, I’d like to make this on Saturday night, but I live in Singapore and the entire island seems to be out of vegan cream cheese. I know the recipe says no substitute, but does anyone know if this recipe will work if I make my own cream cheese? Also, any good recipes for vegan cream cheese? Thank you!! What can I use instead of the coconut cream and oil? Hi Dana (or anyone else who has baked this), do you think it would be OK to omit the cornstarch or is it crucial for the taste/texture? Thanks! Hi Angel! We wouldn’t recommend it, as that is a binder for the cheesecake! Thanks so much. I ended up substituting 3 tbsp rice flour and it turned out wonderfully! So, you can use tapioca flour instead of arrowroot, and similar ratios? Any suggestions on how I should alter the recipe to make it New York style? I added cacao powder to this one and it turned out so so well! I love it so much, it´s my new to go cheesecake recipe. Thank you! So…I tried this with soy free vegan cream cheese, and it never solidified. I’m about to throw it in the trash. Is soy based cream cheese the only way this will work? I’m craving cheesecake but not able to eat it due to a colic-y, possibly allergic baby. Please help! Hi Becca! You could try looking into finding a soy free cream cheese. Daiya has one, or you can also find recipes online to make your own! Can wait to make this cheesecake. Do you think it will freeze well. We are driving 9 hours to our vacation rental and would like to bring it to share with guests. Hi! We haven’t tried freezing it, but it looks like another reader has and had success with it! can i skip the pre baking of the crust? will something bad happen if i do ? Hi! We don’t suggest skipping it, next time either cut the baking time down or lower the temperature of your oven! Hope this helps! I’ve made this recipe twice now, once in a tin using the volume-based quantities, then in a round 9″x9″ round cake tin where I used the metric quantities and scaled the recipe up by 15%. Both came out brilliantly and I’ve served it to nearly 20 friends at a party and they were seriously impressed! The only difference with my version was I used brown caster sugar in the base instead of coconut sugar as it’s cheaper and coconut sugar isn’t always that easy to find. I’d like to try next time with honey as maple syrup makes it quite expensive but I’m not sure as I think the maple flavour adds a richness that is hard to achieve with other syrups. Also I think it was better second time around as I used the nutribullet to blend the cashew mixture (most of it anyway as it wouldn’t all fit! The maple syrup was added afterwards once it was all in a bigger bowl) instead of throwing it all in the magimix, and I think this made it come out a bit more smooth and silky so I’d definitely recommend doing that. I just made this yesterday and enjoyed a piece today. You will not be dissapointed! The cheesecake is yummy and the texture is like “real” cheesecake. A winner! Instead of coconut cream I skimmed the cream off of 2 full fat coconut milk cans. It works! Hi minimalist baker. I’m getting ready to make this cheesecake recipe. But I want to know if cream of coconut and coconut cream are the same thing. I found cream of coconut at my grocery store and its the stuff to make pina coladas. Is that the coconut cream you call for or is it something else? Hi! It is not the same thing, ask at your local grocery store and they will be able to help you! Made this for my boyfriend’s birthday and it was amazing! I used a mix of almonds and walnuts for the base and topped it with candied lemon slices and coconut whipped cream! Neither of us are vegan but we were both really really impressed. Definitely will make this again. I’m wondering if I could blend a few Oreos in with this mixture of would that affect the setting? I just noticed someone recently asked the same! ? I think that would work, but I wouldn’t add too much as you may start to notice a change in consistency and texture. Report back on how it goes! Oops, it was “Food Inc”. I hope to never touch cow food again! I am a 67 year old grandma, watched movies “What the Health” and “Food Matters” last week with my son, and we became vegan before the movies were over. Went shopping with list for this cheesecake recipe. Loved the cheesecake! Next time I will use Karo light corn syrup instead of maple syrup just because I prefer ‘pure cheesecake’ flavor. Could you add ground oreos to the mixture before baking? I think that would work, Erin! I made this for a mix of vegans, vegeterians and meat eaters. They all loved it. Maple syrup isn’t available where I live, so I swapped with golden syrup. It works just as well. Great recipe, and yes, very easy to make. I’m excited to try this recipe. However I’m not a lemony cheesecake fan. If I’d want to make it a vanilla one, how much more vanilla extract should I add? Thanks for the the recipe! I haven’t had cheesecake for so long since I’ve gone dairy free completely. Hi Claudia! I’d reduce the lemon juice but don’t remove it entirely. It provides some “tang.” Or, replace it with a little apple cider vinegar. I’d recommend another tsp of vanilla, OR vanilla bean! PHENOMINAL! I have served this to plenty of “normal” food-only eaters..and they have no clue it’s dairy-free! I even get to eat this for breakfast on the go because it has so little sugar..why not?? A+++++ on this recipe! I have made it in a pie circle pan and a loaf pan..both equally good! I made on with fresh blackberries it turned the most beautiful color purple! I’ve made this recipe several times. This recipe is such a crowd pleaser. I make it for non-vegans and they are always stunned when I tell them it’s vegan. I make mine with half as much creamy filling because I prefer a different base to top ratio and I like putting some blueberries into the filling too. Okay, this is ridiculous. This tastes like real cheesecake. It is amazing. It is perfect. I’m in love. I made a regular graham cracker crust for it because I really wanted as authentic a cheesecake as possible (and am not gluten free). I served it just as is, with no toppings. I really can’t explain how amazing this cake is. Thank you SO MUCH for this ridiculously perfect recipe. This was amazing!!! I’m not a huge baker but I wanted to have a gluten free-lactose free cake for my birthday, and I love cheesecake. I made a strawberry-blueberry topping and I substituted the crust with a gluten free graham cracker crumb crust I made w/ coconut oil (I’m not vegan, just lactose intolerant and celiac). We bought a regular cake for our guests just in case they wanted something a bit more normal, but everyone ended up liking my cake better! I was hoping for leftovers but it was almost all gone! Can I use a radial pan? If so- which size? Made it yesterday, in a springform pan! It worked amazingly. It was so freakin delicious, all the guests were impressed (“Wait what?! It’s vegan?!?? !”… “hold on, there’s no gluten neither?! how can it be”) *proud*! Next time I’ll use a smaller springform pan though, so that the cheese part is deeper/higher (don’t know if this makes sense). So glad I tested this recipe out! This looks great, I have been looking for a vegan base to veganise Ottolenghi’s caramel macadamia cheesecake recipe for my boyfriend’s birthday so I can’t wait to try this! I have a question though: In the UK ‘coconut cream’ is sold in firm blocks for use in curries and things like that – is that what you mean here or are you referring to a cream substitute made from coconut – ie a liquid? I live in the UK. You can get COCONUT CREAM in the UK (it is a cream not a solid like CREAMED COCONUT). You can get it from sainsbury’s and Tesco and am sure other places as well. So excited about all your stuff., wanna be like that movie and try each of your recipes every week! For the cheesecake, can I make it in a pie Pyrex bowl? Has anyone made this in a springform pan? Hi Misty! Bake in a small springform pan lined with parchment paper. Baking time will vary depending on size. Good luck! I’ve already checked the FAQ’s and can’t find an answer…can I use porridge oats instead of rolled oats? Or will they be too fine for the base? Hi Amanda! I think that porridge oats would work as well! Worked a treat :) Took it to a dinner party of 12 where I was the only vegan. Thumbs up all round and even dessert of the year so far from a few pleasantly surprised cake enthusiasts! Thanks for your wonderful (and simple!) recipes! So glad to hear, Amanda! Love this recipe! I’m a beginner baker so I’m always nervous about things turning out how they should. Mine didn’t look as beautiful as yours when it was done so I thought I was doomed… but it tasted amazing! I made it for my boyfriends birthday who is not vegan but really wanted cheesecake and was willing to let me try a vegan version. Thanks for a great recipe, will definitely make again! I made this last night as a Birthday treet for the BF. Neither of us are Vegan but I am trying to go vegetarian and cook more dairy free foods. Made quite a lot of mess, but it was super fun to make. Also I think the baking pan I used was a little bigger than ideal. I didn’t need to cook it for the 50 mins (about 40). It may have been slightly over cooked but it didn’t look burned. Hoping it tastes great! Do you know if this cheesecake can be frozen without ruining the texture? I made this for my boyfriend’s birthday. I hadn’t baked a desert yet with cashews. He LOVES it and so do I! I am so grateful for this recipe & I encourage everyone to try it! Made this today for family dinner awesome!! Even non vegans loved it! Thank you! My teen had been missing cheesecake from years ago when we were vegetarian. She was squealing with excitement over this! She said it tastes like cheesecake and I totally agree! She asked me to make it for her birthday. Welove it. I love this cake. Do you think I could add dark chocolate? Yes! You could also use this one. I made this last night for a dinner party (of omni eaters and vegetarians) and they were dying over this. It’s really a simple and tasty recipe. My boyfriend says that it’s even better the next day. I was wondering whether you had tried this in a round springform pan? The only reason I can come up with for baking it in the bread loaf pan is to make sure the middle gets cooked. Is it possible to do this recipe in a round springform pan? I’ve made this a few times now. It’s incredible. Thank you. Wondering if this recipe would work in a spring form pan? Thanks for all of the deliciousness – kids and adults are huge fans of yours in this family! I made this today(with a few changes, due to lack of certain ingredients). My changes may have changed the outcome a bit, but this dessert was pretty good. It reviewed from my friends that it was not as sweet as the normal cheesecake(which you can change), and was not quit as cheesecake like as expected. either way is still very good and rich. Also, i would like to note that the texture was very creamy and tasty. I made this for Superbowl and it was a huge hit. I made a quick sauce out of microwaved frozen raspberries and peach jam. I have a friend who hasn’t had cheesecake in 5 years because she has to avoid dairy and gluten. She was in heaven and ate two slices. Everyone said they would never have guessed it was vegan. The only thing I would change for next time would be to omit the coconut sugar from the crust and use a couple of dates instead. I found the crust to be pretty crumbly, didn’t hold together very well when slicing/serving. This is awesome. I made it for some Vegan Birthdays and they loved it. I have made these a few times and LOVE them for my son and I. I am curious if anyone has tried these in the Instant Pot. I wanted to make individual cups using mason jars and would love to know if this recipe would work for 30 min HP NR. did you try it in the IP? If yes, how long on HP? First of all I have to say that I love all your recipes. So my question is ,is there a different way to make this with out using nuts? For people who can’t have any nuts? If so what do our suggest ? Tofu? Hi! If you can’t have cashews, the next best thing I can recommend is subbing either macadamia nuts, or upping the amount of coconut cream to 1 1/2 cups, and supplementing with 3/4 cup extra firm silken tofu. I have not tested the recipe this way, however, and cannot guarantee the results. If you give it a try, let me know how it goes! I was wondering if any cream cheese would be okay? We don’t have Trader Joe’s in Aus, so it wouldn’t be an option. Hi! Any cream cheese brand should do the trick! Best vegan cheese cake. Found a vegan graham cracker crust. And didn’t add maple syrup. And it was so delicious. Made. One for Thanksgiving. And one with lime for Christmas. Thank you so much for the recipe. I would like to make this as cupcakes. Any suggestion on baking time or temperature changes? Any help would be greatly appreciated. Hi! I haven’t tried it but it should work! You are going to want to reduce your baking time though as cupcakes generally require less time! Any replacements for the coconut cream? I’m allergic to coconut! Your recipe is AMAZING!!! I made it for a dinner party and everyone GF/VG or not LOVED it! I’m planning on making it again for New Years and wondering if adding pumpkin or another type of filling to make this a pumpkin or berry cheesecake would work? Any suggestions on what to leave out if incorporating other flavors so it doesn’t become too runny? Hi! Glad to hear that it was a hit at your dinner party! I haven’t tried altering this recipe but if you do, I’d love to hear how it goes! Have you thought about adding a topping instead to change up the flavor? If you do end up adding pumpkin/berry to the filling, you may want to cut down the amount of vegan cream cheese used, but again, I haven’t tested! Happy baking! I rarely leave comments, but this cheesecake was amazing! It tastes just like real cheesecake. I made it with a classic graham cracker crust and it was delicious. Dana-I made this cheesecake yesterday and served it today following our christmas meal. I followed the recipe exactly and I think it was the best cheesecake I have ever had, my guests could not believe it was vegan. I toped it with the coconut whipped cream and fresh raspberries. My dad even said your cheesecake is better than the Cheesecake Factory cheesecake and that if you sold it to them, they would sell it by the truckload! Happy holidays and many thanks for this amazing recipe!! I made this, it was great. You could slightly taste the cashews, but it was rich and creamy just like the real thing. My daughter recently was told of her alergies to gluten, eggs and dairy, so I made this especially for her, but everyone loved it. Thank you for the recipe. Would this cheesecake work with a graham cracker or an oreo crust? Yes! Just pre-bake (not too much – slightly brown) and then bake along with the filling! I was a pastry chef in my former life before I was vegan. I have done a ton of R & D using various recipes. This one is excellent. I made it today, but tweaked it to be a pumpkin cheesecake. Instead of the vegan cream cheese, I substituted baked pumpkin and silken tofu, then added some pumpkin spice and ginger. It looks and smells absolutely amazing. I also upped the amounts in order for it to fit into a standard springform pan. I will keep using this as a base for future “flavored” cheesecakes, as well as the classic. Thank you so much for your excellent recipes. I frequent this site often and have had much success with your recipes and ideas. Made this Wednesday evening for thanksgiving and oh man, it was delicious ? My uncle who has celiac disease was so happy, as it’s been a long time since he’s been able to eat a cheesecake! Thank you so much for sharing your recipe!! I am not vegan by any means, but I ended up making this for Thanksgiving as a healthier dessert option, and I am impressed!! The crust recipe is amazing, and the filling is creamy with a nice buttery, lemon flavor. I didn’t end up using the maple syrup since my coconut cream (Goya) already had a lot of sugar added, so wondering which brand of coconut cream was used? What is the next best thing to coconut oil? vegan butter or olive oil? Can this also be used a a base recipe to then add flavor to (i.e. add a can of pumpkin and spices to make it a pumpkin cheesecake)? What does the 2/3 cup of maple syrup do in this recipe? Can I use pancake syrup? any other substitutes? Hi there! It is a sweetener. You can certainly try subbing other sweeteners, but wouldn’t recommend fake maple syrup. This sounds delicious! One question, if i wanted to make it a pumpkin cheesecake, at what stage would you add the purée and how much? Hi there! I’d maybe suggest adding 2/3 cup pumpkin puree during the blending process, along with 1 tsp pumpkin pie spice + more to taste. Good luck! Is there a way to convert this to a standard springform pan? I want to make it for a party and I just like the way the round ones look. I have made this 4 times I and everyone who has tried it absolutely love it so thank you very much for sharing this recipe. I am vegan and love to cook so really enjoy baking cakes. My 4th attempt came out the best because 1. I didn’t bake it for as long as the others, even though they tasted delicious they were a lot harder than my last cake which I baked on a lower heat and for at least 15 minutes less time. Ovens do definitely vary. and 2. I first used violife cream cheese but this time used Tofutti for the first time which I think did made a big difference. Also its very nice if you make your own strawberry or raspberry sauce to drizzle over it, amazing! Made this for my girlfriend’s birthday, it’s absolutely incredible!! I think I used a bit too much coconut oil in the topping so it took a little longer to bake. A bit brown on the top so I covered in in coconut whipped cream – even better!! This recipe is AH-MAZING. I brought it into work for all my non-vegan coworkers and they gobbled it up! Two people told me I should sell it and one person said it was the greatest cheesecake he’s ever had! I’m making it again right now. This time I significantly upped the lemon juice and lemon zest and then marbled a raspberry sauce on top to make a lemon raspberry cheesecake. It can’t bake quick enough! Thank you!! Do you know if it can be frozen? Would the texture still be the same if it was frozen and thawed later? Thank you. I love your recipes! I would love to try this, I don’t, however, have cream cheese. Is it possible to omit it? Loved it! Makes mine for a bit too long, but it still turned out great! Also, I subbed the maple syrup for good quality honey. Stunning results! Made this cheesecake yesterday, but added 1/2 cup of frozen blueberries to the mix before blending and used my own graham cracker crust recipe. The blueberries made it such a beautiful color… But this baked cheesecake did not disappoint!! I’ve made so many raw cheesecakes before but this baked version really gave me that taste and texture I was looking for. Thank you Dana for another outstanding recipe!!! I just tried this recipe on Labor Day and with 2 minor substitutions. First, I did not have any maple syrup so I substituted honey from my dad’s hives. The honey was very delicate in flavor and if anything, might have made the cheesecake too sweet. Secondly, I was hoping for a key lime taste so I replaced lemons with limes. I may have overdone the lime though as the flavor of the lime intensified with baking. I also made another mistake with the crust and baked it a bit too long. The texture of the crust remained a bit more crumbly than is ideal and I have contemplated if it needed an additional binder like the 1 tbsp. ground flax-seed/2 tbsp. water that one uses to replace egg. I would definitely do this recipe again. Hey – I’ve recently got my hands on some amazing vegan baileys (called besos del oro if you want to check it out!) and I’m wondering how you might suggest incorporating it into the recipe? Less coco cream maybe? I came up with a name for my cheese cake! I call it tease cake since its vegan! Mine is baking in the oven right now so I havent tasted it yet but i dont have any doubts about it. I replaced the oatmeal with actual graham cracker because graham cracker crust is my favorite. The smell of the crust after it was baked was heavenly. The whole tease cake has been in the oven for 65 min now and still seems to jiggly, maybe i will do a little less coconut cream next time but im excited to try it! It smells amazing! Thanks for the recipe! My non vegan friend has requested a strawberry cheesecake for his birthday, and this recipe looks like the best I’ve seen so far, especially given that it will be scrutinized by a load of non vegans……..apart from that its not a strawberry recipe that is! I love your recipes in general though, so can I make this strawberry flavoured simply by adding strawberries into the filling mix? Not sure how that will go down in the oven is why I thought I’d ask. Or do you already have a strawberry cheesecake recipe I’ve missed while searching? I am so Excited to try this recipe!! I have been wanting to try one that has a substitute for cornstarch as my loved one also is allergic to corn. Your recipes are always so amazing! Thanks for this one ?. I see a lot of recipes that use coconut milk and cream. I have used coconut oil to cook with and it does not taste like coconut. But doesn’t the coconut milk and cream impart a coconut flavor to the recipe? This is my question, and I could not find the answer on the FAQ’s page. If you agree that coconut milk and cream make the recipes taste like coconut, then what could I use as a substitute? Thank you!! Ahhhhhhmazing!! I made this in a 8-9″ spring loaded pan, bottom lined with parchment paper. It turned out great! Brought it to a vegan bake sale and it was gone so fast! I topped it with the strawberry chia jam from oh she glows blog. It was amazing. A must try!! I was so excited to try this since I’ve made so many dinners etc from recipes on here, all of which have been a success. I followed this recipe exactly, used my Vitamix to get it all nice and creamy and baking it for 50 minutes since it was looking brown on the top. That made me a little concerned but I let it cool overnight and had a slice for lunch. However, upon tasting, it wasn’t bad but it definitely wasn’t very good either. The crust was burnt, greasy and the filling was more like a very greasy, spongy pudding, not like cheesecake at all. I’m hesitant to try this again unfortunately. Maybe my oven was hotter than usual? Maybe it was just over cooked? Either way, it was just far too greasy for my liking. I used a springform pan about 8″ and it worked great! Just made this tonight, and let me tell you it is AMAZING!! I ended up subbing the oats in the base for plain gluten free flour as unfortunately oats aren’t gluten free in Australia :( , however it still turned out fab! I also did this in a round, loose bottom tin which still worked well . The texture of the filling is so creamy and…cheesecake-like, my family loved it! Can’t wait to try it on the test subjects at work tomorrow. Hi! I am wondering if I can sub hazelnuts for the almonds in the crust? Originally I wanted to do a raw crust but I’m not sure how to bake the filling without a crust. What do you think? I want to top it with coconut whip and lemon zest! Fantastic recipe! The closest to baked cheesecake you could get without using cheese. I baked it in a shallow flan case and only baked for 30 minutes, otherwise followed exactly. I’ve made a lot of vegan cheesecakes in my day and let me say, I’m eating this one right now and it is AMAZING. So creamy, dense, bright and flavorful. A lot of recipes promise all those things but have to be frozen. This one can actually deliver all that AND handle an hour or so at room temp and still look and taste gorgeous. I kept the filling as is but used a gingersnap and walnut crust. I will make this again and again whenever the need for cheesecake arises. I served with homemade caramel drizzle and a blueberry+blackberry+raspberry combo. Thanks so much for this stunner. Could this be made in a standard 9 inch pie dish? I tried this recipe today. I used silicon muffin cups, and the crust burnt. How should I adjust crust thickness, heat or time in the oven if I’m using silicon cups? Hmm, haven’t tried this with silicon cups. Perhaps just bake at 350 the whole time for just 15 minutes? Dana, I just love your recipes. I had to add ‘Minimalist Baker’ as a tag in my Evernote recipe notebooks as I have so many of yours. I will be making this cheesecake as it is something I really miss from my non-vegan days. Your recipes are always beautiful, easy and turn out even better than I hope they will (Easy Vegan Gluten Free Brownies (oh my!) , SPICY RED PASTA WITH LENTILS (do not like lentils but the sauce was great), and Easy Vegan Falafel (I made falafel that I liked! Finally) – all spectacular!. Thanks again, Dana! Great job! Hello!Has anyone tried any toppings on this cake? I made this Cheese Cake this weekend. It was delicious! Thanks for all of the effort you put in to get it just right. I just made this for Mother’s Day and my. God. This is the most incredible vegan dessert I’ve made!!! Everyone absolutely loved it. It tasted just like the classic cheesecake I’ve been missing since going vegan! Thank you so much for your great recipes! Do you think you could make this in a food processor? My blender is nowhere near as powerful as a vitamix/blendtec and until I can afford one, I’m using my processor for lots of things! I know it would probably be less smooth, but could it still work? is it possible to use regular, organic milk based cream cheese in this recipe? i would give this one a 3.5/5. the cashewy flavor made it taste less like a cheesecake. would adding more tofutti and less cashew make it better? i will try that. i’ll also try less sweetener. otherwise, it held up pretty well. i also used the graham cracker crust recipe from your chocolate peanut butter pie instead of the almond-based one, because i didn’t have almonds on hand. May I ask, your coconut cream is sweet? Because here in Dominican Republic we can only get sweet one. The coconut cream used here is not sweet. It is available at a store called Trade’s Joe. This was amazing! The only bad thing I can say is that it was too dang good and I couldn’t stop eating it. I cannot wait to make this for my meat and dairy eating friends, they will be amazed. Thank you for the recipe. I cannot wait to make this! My hubby always wants cheesecake, and since I recently went vegan, I haven’t been able to find a good, baked cheesecake. Will make soon! THIS IS AMAZING!!! Mine was not quite as smooth (b/c my blender isnt amazing) but the flavor is sooooooo good. I am also happy to report that rhe flavor and texture isnt changed by freezing. Just slice, freeze, and pull a slice out in the morning for a sweet in the evening. So I made this and the top cracked and it fell a little in the center :( I haven’t tried it yet, but what do you think I did incorrectly. I would love to perfect this for next time! Update: we ate it today. The flavor is absolutely delicious. It is just sunken in the middle. Not sure if it’s from the high blending in the vitamix? Have you experienced this? hello Hailey, I am sure your reading of helpful hints in cheesecake baking have discovered that a pan of water increasing humidity in the oven or a convection stove with a fan helps in minimizing the cracking. Or enclosing your cheesecake pan in one of those plastic covers they use for cooking turkeys in and then submerging it into a water bath to bake in the oven will also do the same thing. I made it and it is freaking fantastic.. So, I’ve had an issue with EVERY recipe I’ve tried from Minimalist Baker. This baked cheesecake. The salted caramel peanut butter truffles. Whoopie pies. Pumpkin spiced apple pie. You name it. I’d expect every other, unsuspecting follower has felt the same! I don’t know how… I mean, I just can’t… Look, here it is, I’m just gonna have to come right out and ask – is Hogwarts real? Did you go there? Is there a Culinary Arts division that was left out of the books? And it’s like you don’t even care – you just give that magic away! I literally cannot understand your sorcery, but I’m a massive fan. Thanks for coming up with awesome stuff. Thank you for concocting a vegan version of cheesecake. I just finished making this and sampled it. I don’t think I want to share with my friends anymore… ;) I appreciate the time you take to re-imagine the standard American fare as well as generously sharing your creative ideas for those seeking a healthy alternative. So again, thank you! Can confirm that this recipe is amazing! My non-vegan family was so impressed and agreed that it tasted just like traditional dairy cheesecake. I haven’t had real cheesecake in years and I forgot how much I LOVE it! This is the real deal, thank you so much :) I ate the whole thing myself and I don’t feel bad at all! LOVED this….made it last night and it is amazing! I cannot eat all of this in two days…so just wondering if I can freeze the leftovers and if so the best way to do that. thank you! I’m so looking forward to diving into this when it cools. I had a similar problem though as a previous commenter, when I blended together my filling, it was nice a creamy and then all of the sudden seperated and I couldn’t get it to come back together. Hoping my cake turns out okay. Any reason why that would have happened? Man, this recipe looks good. I really want to try it, but i don’t tend to react well to coconut milk, and I’m afraid coconut cream will be worse. Any ideas for substitutions? I didn’t see anything about coconut products in the FAQs. On my first attempt, while blending the filling ingredients (in my Ninja processor) it definitely separated. I couldn’t have blended for more than a minute. It went from appearing almost pudding like with a few specks of cashews, so I let it go just a bit longer, and then it was just a mess. Do you think I just blended it for too long? I’m now trying it for a second time, after I blended it with a close eye, and not too long. I was wondering if I could freeze this cheesecake ? Hi Myriam! Dana answers questions about freezing her recipes here. is it wrong to have made this cake four times in the past week? tastes 99% like real cheesecake. tried to make it with white sugar instead of maple (to lower the cost a bit), and although the top looked a little less ‘cheesecakey’ it tasted almost the same. i found that the addition of coconut oil doesn’t affect the texture all that much but i might be wrong. also, tried to make it with block tofu i/o tofuti (again, to lower costs), but the cheesecakey flavor was dimmed in favor of a slight ‘soy-y’ taste. still pretty tasty. I’ve been vegan for only 1.5 months now so I have tried so many different cheesecakes before but this not only tastes just like real cheesecakes (my non-vegan friend had no idea it was vegan) but the best cheesecake I have ever had in my life. Dana, thank you so much for sharing such an amazing recipe! You make being vegan so easy! I’m in Victoria and Toffuti vegan cream cheese is available in my local Woolworths in Ferntree Gully. I just bought some from there today to try this recipie (will provide a rating once made). It comes in a 227g tub which aligns with this recipie perfectly. Hi Suzanne, I live 8n Qld & turns out Woolies stock tofutti. Thanks for your help! ? I would love to see a recipe for a yummy strawberry sauce topping!!! I include one in our cookbook! If you weren’t already married and if I didn’t already have this beautiful boyfriend that I adore I would propose to you woman! Lol! This Vegan journey has been fun so far (especially with your AMAZING recipes) but my heart quietly mourned for the loss of cheese and most importantly cheesecake. I won’t even lie to you. I set my expectation not too high ONLY because I didn’t want to be left broken, lost and wounded. All that’s left to say is I made this over the weekend and Wow. Wow. Wow. Amazing! Simply amazing! This recipe was UNBELIEVABLE. I made some in hopes of sharing with the neighbors but for some reasons beyond my control…it never made it over. Lol Thank you for this epic recipe. ????? My husband and I eat vegan quite a bit for religious purposes, and it can be difficult to get my sweet fix. Since we eat both vegan and non vegan food it is also hard for me to get on board with vegan foods that try to emulate non vegan, so was admittedly more than a a little skeptical of a faux cheesecake. So we tried it and I must admit this is pretty AWESOME! The flavor and texture are very close the real thing. I was out of lemon juice, but found that about two tablespoons of lime juice worked just as well. Thanks for this recipe! This is beautiful. I never thought about doing a vegan cheesecake. Simply Awesome. I am planning to make it on our anniversary. Yum!!! That looks so amazing! I too have not had a baked cheesecake in ages. I need to try this out. Thanks! 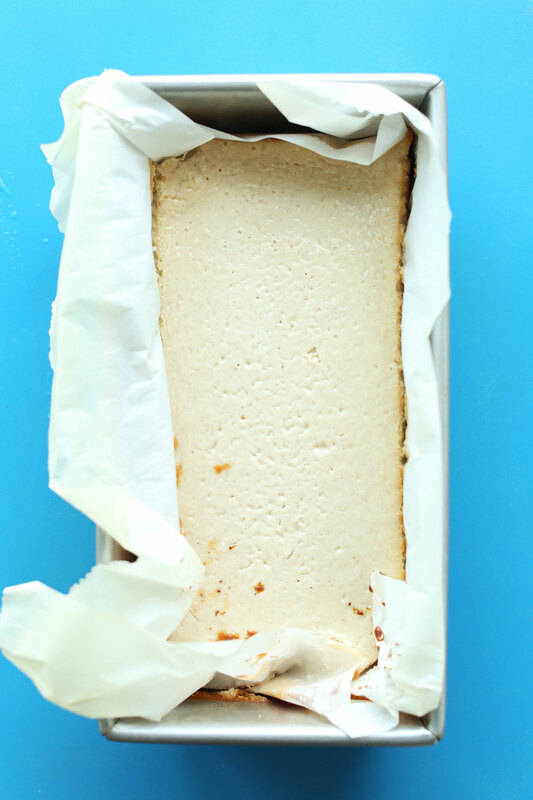 Have you ever froze the EASY BAKED CHEESECAKE (VEGAN + GF)? If so was it ok out of the freezer after a few weeks? Hi Carol! Dana answers your question about freezing recipes in her Recipe FAQ found here! I Made this last night. omg omg its the best cake I made! Yay! Give it a rating if you wouldn’t mind! I made this today, and it’s currently cooling in the fridge! One question : Do you recommend any alternatives to maple syrup? It was pretty hard to use 2/3 Cup of liquid gold in one go! I know! You can definitely try subbing agave nectar, or honey if not vegan. Thanks Katie! So kind. Hope you love this one! There is something about the arrival of spring that makes me want to bake make cold desserts. This recipe makes me so happy because it actually has lots of good-for-you ingredients PLUS looks amazingly delicious! Can’t wait to try it. So great! Thanks for sharing, Karel! I have an allergy to cashews. Most of your ‘cheesy’ recipes are cashew based, do you have a nut you would substitute? Looks delicious! I don’t have access to store bought vegan cream cheese. Any way I can make my own? I did my own vegan cream cheese for this recipe and it was delicious! All you need is raw cashew, apple cider vinegar and lemon juice. Just Google it! I absolutely love this! I haven’t had a baked cheese cake in so long, i usually just made a raw cheese cake. i’m very much looking forward to giving this a try. Thanks you! Oh.my.goodness! I am so excited about this! I have dairy, egg, and gluten allergies and refined sugar makes me crazy (like in an overly hyper heart racing type way), so this is the most exciting thing I’ve seen since sliced bread. Thank you so, so much! I cannot wait to try it! Thanks Hunter! Let me know how it goes! Dana, I love all your recipes! One question… How is it you don’t weigh a 1000 lbs.? Coconut cream, cashews, etc. etc. I know, I know, everything in moderation! Thanks for the inspiration! I am making your blueberry lemon waffles tomorrow for breakfast. Yay! It’s funny, the last half-marathon I ran I went to The Cheesecake Factory the day before. After seeing your beautiful photos I think I’ll make this and enjoy after my next run, that will be tomorrow. Great way to end my weekend. Yay for cheesecake! Is there a way you can omit the coconut oil and substitute it for something a little less dense? Will it make a big difference? Hi Cassie! I haven’t tried any modifications, but omitting it may be possible. Let me know if you give it a try! Avacado oil is a great substitute for coconut oil I use it all the time ??? Could you do this in a springform pan? Thanks! I put it in the 9inch one. Highly recommend the parchment paper like she said. Just cut it up to fit. I didn’t put parchment paper and it was slightly sticky but it was still delicious. I also kept an eye on it and took it out at 45ish minutes since it was browning a bit. Avacado oil is a great substitute for coconut oil I use it all the time ???? Cheesecake is a huge splurge desert and your spin looks just like Grandma’s, exactly how my Russian Grandma used to make it! Fond memories. I must admit, it made me riddiculously happy :) I haven’t had a baked cheesecake for waaaay too long!